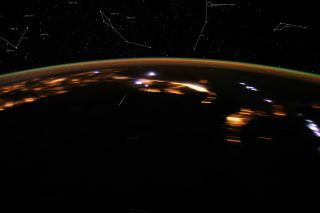 What is very likely a Lyrid meteor is captured in this image (in a 6-second exposure), taken April 22, 2012, from the International Space Station by astronaut Don Petit. NASA astronomer Bill Cooke added the outlines of the constellations at the top of the image. Top off your Earth Day celebrations tonight (April 22) by watching a parade of falling stars: The Lyrid meteor shower peaked this morning about 8 a.m. EDT (1200 GMT), but the display will continue tonight, according to NASA. The Lyrids appear every year around April 20 as Earth passes through the orbital path of Comet Thatcher. The small meteors left behind by the comet fall through the planet's atmosphere, putting on a stunning light show for skywatchers. The prime viewing time for the Lyrids continues tonight and into Sunday morning (April 23), according to NASA. A few remaining Lyrids might even be visible in the early morning on Monday (April 24), according to Space.com skywatching columnist Joe Rao. This NASA sky map shows the location of the Lyrid meteor shower radiant in the eastern night sky just after midnight on April 22, 2017 during the 2017 peak. While the Lyrid meteor shower has at times produced as many as 90 meteors per hour, this year skywatchers can expect to see about 18-20 per hour during its peak. That number will be reduced on cloudy nights or in locations where light pollution is high. The Lyrids are so named because they appear to emanate from the constellation Lyra, the Harp. (You can typically find Lyra by looking to the northeast of the bright, blue star Vega, one of the brightest stars in the northern sky this time of year.) In the Northern Hemisphere, the Lyrids' origin point will rise from the northwest after twilight, and reach a point high overhead after midnight. Editor's note: If you snap an amazing photo of a Lyrid meteor that you'd like to share it with Space.com and our news partners for a story or gallery, you can send images and comments in to managing editor Tariq Malik at spacephotos@space.com.